The long-form census was an indispensable resource for planning and policy making. Now that it has been dispensed of there is a massive void in universal, comprehensive, local information. A voluntary survey and private sector ?big data’ cannot effectively compensate for its loss. Universality is key as everyone should be counted equally. Private sector ?big data’ cannot compensate as it tends to measure consumerism rather than citizenship. In this scenario the most vulnerable in society are left out. Alternative sources of data also do not capture the range of information contained in the long-form census which links demographics, to employment, to dwelling characteristics, and so on. Being able to better understand how various dimensions of society fit together is an essential aspect of such research tools. Additionally, the long-form census allowed these dimensions to be placed within a consistent geographic context. For example, knowing the average income in a particular neighbourhood is only meaningful when you can compare it directly to other neighbourhoods. The long-form census is unique in this ability not only due to the overall size of the sample, but because every local area is sampled in the same manner. The 21st century is a knowledge-driven one. Sound economic decisions require good information in order to spot emerging trends and minimize potential risk. Data has the power to illuminate societal issues. It helps frame questions and provides essential context to debate. Strong democracies depend on a well-informed citizenry. The recent retrenchment of resources intended for efforts to improve our society are having serious negative consequences. With this in mind, Canada needs to do three things to lead the world on public data collection and dissemination. The first is to not only heed the call to reinstate the long-form census but finds ways to radically improve it. One way to do this is to increase its frequency. Other countries such as the US have supplemented periodic censuses with annual surveys that are able to capture community change. This is particularly important in relation to the timing of the census within business cycles. For example, from the Census of Canada in 2006 and the National household Survey in 2011 it is impossible to understand how the 2008 recession affected various localities. An additional improvement involves updating the types of questions in order to better reflect modern society. Changing realities such as individuals holding multiple jobs need to be accounted for as do the emergence of new technologies such as the internet and smart phones as they relate to infrastructure needs. Linking an enhanced survey to other government information such as tax filings could also reduce the number of questions required. There are many ways such an essential research instrument could be improved and yet Canada is falling behind by going backwards. The second pillar is opening up information that is collected through the daily operations of the public sector. The census and similar research instruments should not be the sole source of planning related data. New technologies that automate and facilitate the collection, storage, and dissemination of information allow for greatly increased possibilities for freeing data derived through the regular activities of government. Similarly, these technologies present new opportunities to connect and link data across the public sector. The challenge is often organizational in nature rather than technical, however the benefits of sharing information are exponential. To this end the private sector can also play a productive role. From large companies such and Dun & Bradstreet who have developed tried and tested ways of linking business data, to small start-up app developers who can provides tools to let citizens know when the next bus is due to arrive, government should not shy away from such solutions especially over ideological concerns. The third aspect is that a cultural change is required not just within Statistics Canada and government but across all of society in order to fully utilize new data and technology. High quality open data can only be effective if citizens are able to make sense of it and make informed choices as a result. One part of this is effective dissemination and communication of information from Statistics Canada and other government bodies. The other half involves education in terms of improving scientific and data literacy in schools as well as the adult population. Classrooms need to be modernized and curriculums updated to reflect the increasingly data-driven world. Higher education institutions can also play a key role by upping their level of engagement with their wider communities and sharing their knowledge and expertise in a public-facing manner. Meric Gertler, the President of the University of Toronto, has pledged to do just that by making an institutional commitment to active community building which includes data generation, sharing, and analysis. 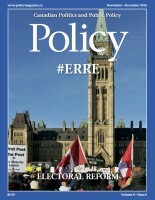 During the peak of the debate on the replacement of the long-form census, then house Leader John Baird offered that the government has no business in the bathrooms of Canadians, a reference to a question on the long-form pertaining to the number of bathrooms in respondents’ homes. The implied belief is that such questions are silly and the information obtained is trivial. Yet, deciding where we build pipes and how big they need to be, is a very real, tangible, and important planning activity without sinister motive. Most government policy making never makes the news. We tend to take for granted that when we turn on the tap, water comes out, and that when we flush the toilet, it goes away. These things may seem boring and banal, but they are far from trivial. Ensuring that such boring and banal things continue to function properly requires careful planning and budgeting. Data is a crucial tool for strong democracies and it needs to be first-rate, plentiful, and accessible. Gregory M. Spencer is a Research Associate with the Martin Prosperity Institute at the Rotman School of Management at the University of Toronto. He leads the development of urban data science at the MPI and conducts research on the economies of cities. Greg has published in the top international academic journals in his field on the topics of industrial clusters and the social dynamics of the creative process.With over 15 years of consulting experience in Canada and the UK, Greg works extensively with all three levels of government. While employed at the Munk School of Global Affairs he developed and managed Local IDEAs (Indicator Database for Economic Analysis). Prior to his academic career, Greg was Principal Consultant and Head of R&D at the Local Futures Group, an economic development consultancy based in London, UK.Greg has taught undergraduate courses in Research Methods and Regional Dynamics in the University of Toronto and Queen’s University as well as Planning Methods in the Master’s Program in Planning at the University of Toronto. Greg holds a Ph.D. (Geography) and M.Sc.Pl. (Planning) from the University of Toronto and a B.A. in Geography from Bishop’s University.